(Host) More than a thousand people gathered in Brattleboro on Thursday to protest Vermont Yankee’s continued operation. The protesters marched three miles from the Brattleboro common to the plant’s headquarters. Some walked on stilts, some carried signs. They sang, they acted, and even committed civil disobedience. VPR’s Sarah Harris caught up with them and has our story. (Harris) It’s a hot March day in southern Vermont, 80 degrees. The Brattleboro common is packed with people gearing up for a march to Vermont Yankee headquarters. Jonathan Morse is from Marlboro. He’s 68, runs a construction business, and is wearing a sign that says, "I work for a living." (Morse) "I’ve worked hard my whole life to raise my family and now see my grandchildren. And I don’t want my grandchildren to be saddled with any more nuclear waste than has to be." (Harris) There are all types of people here, and everybody has a different way of protesting. For Paul Dobbs, it means balancing an enormous statue on the roof of his car. (Dobbs) "It’s a 9 foot tall man, a robber baron type fellow from the 19th century. And he’s sitting solemnly in front of a table with a bag of money on it and he’s thinking about his money." (Harris) But the biggest entertainment of the day: political theater. Puppeteers, performers, and activists have come from all over Vermont, New Hampshire, and Massachusetts. They’re hoping that introducing a little humor will get their message across. A group of singers called the Raging Grannies leads the crowd in protest songs. They sing Yankee Doodle Dandy, only with new lyrics. (Chorus) "Vermont Yankee is 40 years old; scheduled to close in 2012. We’re all Yankee doodle victims. ‘Cause from the plant we could all die…and radiation from the sky." (Harris) A group down from Burlington is putting on a "False solutions circus." They’re all dressed as green clowns and are poking fun at the energy industry. 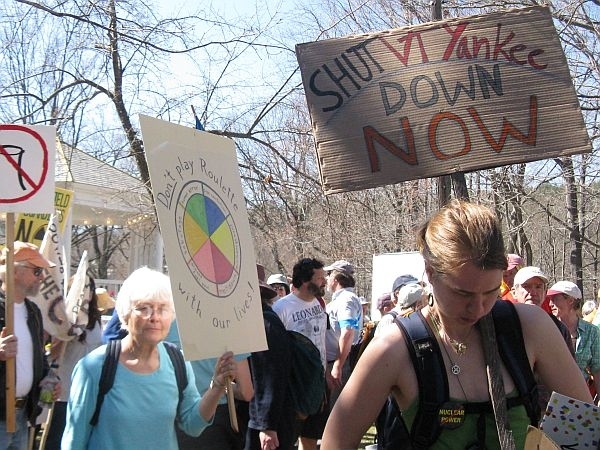 (Harris) Around 3 p.m. protesters make their way toward Vermont Yankee’s property. It’s a kind of theater in itself . People gather across the street from headquarters, and police are on hand, ready to arrest the protesters who commit civil disobedience. (Chant) "Shut it down! Shut it down!" (Harris) The first protesters make their way over the barricade and line up to be arrested. It’s turned a little more serous-but the show goes on.